Like many people at this time of year, my husband and I recently were invited to a masquerade-themed party. Rather than settling for store-bought masks, I decided to make some that better reflected our interests. Naturally, this meant steampunk. Inspired by this fantastic tutorial on making cheap and easy steampunk goggles, I found that creating your own gear-covered masks isn't tough (as long as you don't mind ending up covered in super glue). Initially, I tried to plan masks that would look functional: eyepieces, cogs attached to movable parts, riveted metal, and so forth. Unfortunately, I didn't have the materials or the skills to build something that looks like you could use it to pilot your dirigible. So I ended up with a decorative look, more fun than functional. 1. Remove the flip top, then carefully cut a hole in the center of the ketchup bottle lid to serve as an eyepiece for the male mask. This lid had an industrial striped, segmented look that I loved. I also cut a circular bit of cardboard off of a piece of packaging around our house for the second eyepiece. 2. Cut white felt in an artistic shape of your choosing for the decorative element of the female mask. I wanted it to look as if a different piece of metal was welded on top of the mask. 3. Spray paint the different pieces: silver for the masks and copper for the felt and eyepieces. This is also a good time to paint the chopsticks that will serve as the handles. 4. 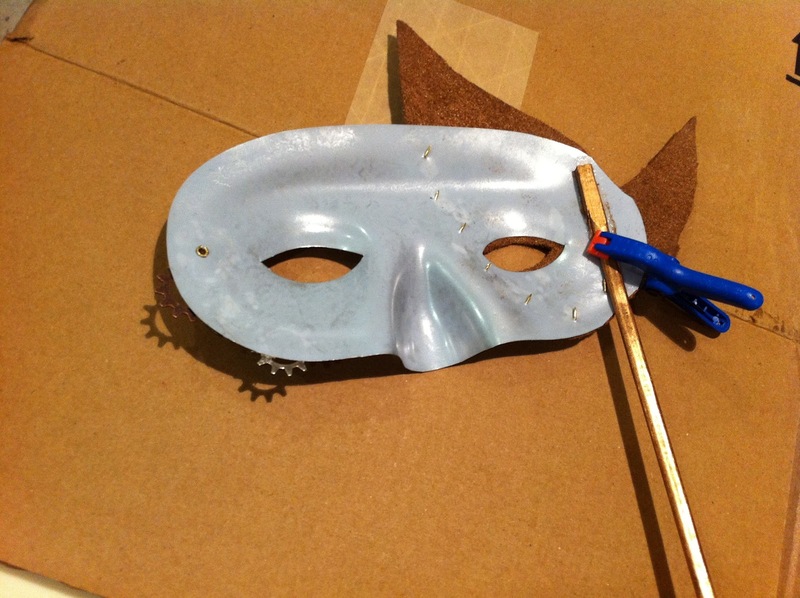 Once everything is dry, super glue the felt piece to the female mask, then add thumbtacks to serve as rivets. The little clamp was hugely helpful in holding everything in place while the glue dried. Be sure to bend the points on the tacks down on the inside of the mask, or you will lose an eye. 5. Add cogs in a decorative fashion. Because I couldn't make them seem like they were serving a function, I just overlapped them as stylishly as I possible. 7. The male mask was a little more complicated. First, super-glue some metallic finishings from the sewing section of Walmart onto the spray-painted ketchup bottle lid. Getting that stupid lid to stay put was the hardest part. It was heavy and flat, and the mask wanted to curve over the eye. I had a few re-gluing sessions with it. I also cut the eyehole to match the width of the eyepiece's center. 8. Glue on the second eyepiece, then cut black felt to mimic the a goggle strap, and glue this on. 9. Next glue the decorative cogs around the smaller eyepiece. I tried to mix the different metal tones and textures for an interesting effect. 11. The final step is to glue the spray-painted chopsticks onto the back of the masks to serve as handles. I had removed the thin elastic bands from the masks, but you could also leave those on so they're hands-free. And there you have it! Steampunk masks for the discerning masquerade attendees. Seriously, try this at home. It's a fun exercise in crafty creativity. These are super cool looking! Just because it has gears on it doesn't make it steampunk... People need to realize this.